I published my first Fat Head blog post on March 20, 2009. That means yesterday was my 10-year blogiversary. Time flies, and the older I get, the more it seems to pick up speed. Sure doesn’t feel like it’s been 10 years already. That’s Sara in the picture. Sara, who’s now a sophomore in high school and will get her learner’s permit soon. Sara, who’s already in the process of winnowing down her choices for college. Sara, who watches shows like Better Call Saul with us and makes insightful comments about the characters. She was in kindergarten when I started blogging. I hesitated for a few months before starting the blog. By the time Fat Head was in the can, I was burnt out from the effort of making it. I figured I was done with diving into diet and health research and trying to make sense of it for an audience. I was also a bit worried that if I started a blog, I’d run out of things to say after a year or so. He was absolutely right. Much of what goes into the blog comes to me through readers. Often I receive emails from senders whose names I don’t recognize, with a subject line something like You’ve got to see this! or Do you believe this stuff? The entire body of the email will be a link to an article on this or that study or some nonsense about diet in the news. Dr. Sacks and his fellow researchers got the result they wanted by coming up with a definition of “low-carb” that is, to put it charitably, rather creative: 35 percent of total calories. Yup, the “low” carbohydrate diet was anything less than 44.8 percent of daily calories. Boy, doesn’t that sound just like your ketogenic or Atkins diet? The Anointed will never change. But my life certainly has. When I started blogging, we still lived in Burbank, just outside Los Angeles. We moved to Tennessee later that year and a rented a house. Two years later, we bought the farm, which has provided us with fresh produce, fresh eggs, and one labor-intensive project after another. And I mean that in a good way. During the past 10 years, my diet has gone from being all about low-carb (with low-carb junk foods included), to real-food paleo, to strictly ketogenic (long enough to realize it’s not my thing), to something more along the lines of Paul Jaminet’s Perfect Health Diet, to a version that’s higher in protein and a bit lower in fat, as recommended by Dr. Ted Naiman. My ambitions have changed as well. After our frustrations with the first two distributors for Fat Head, I swore I’d never make another film. 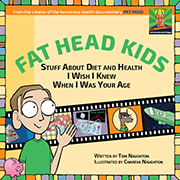 And yet Chareva and I eventually produced Fat Head Kids, after producing the book version first. Now I’m thinking about making some of my posts video posts. After all, I have the equipment and the software. It’s been a great 10 years, folks. I appreciate all of you who show up here regularly to read and comment. I sincerely hope I’ve helped some of you find the path to better health, or at least kept you entertained along the way. I hope to do this at least another 10 years, and I hope you’re still here too. The Farm Report: If You Order A Spring Project Right Now, We’ll DOUBLE Your Order! Love all your blogs but especially your farm reports. I would rate your farm perfect if you added a Jersey milk cow. Now that your property will be totally fenced the cow can wander without getting lost. Some cows can find their way home when the need for milking happens. A cow is on our wish list. We’ll see if it happens. No California cow for the same reasons. NJ just passed a tax on rain water that lands on your property! Damnit. Now more of them will move here. The ability to be able to keep it going (and interesting!) for 10 years, regardless of whether it’s your own ideas or ideas people send is impressive. Especially given the day job, family, and films. Well done, congratulations, and I look forward to many more posts! Any interesting stats from the 10 years? I’d have to think about those stats. I think I’ve been here from near the beginning. Doesn’t seem that long ago. I’ve found Naiman and Bailor to be in line with each other. Bailor is more succinct in what he recommends. If you ask Naiman whether he uses 80/20 ground beef or 85/15, he won’t give you straight answer, unless you become a patient of his. Did you watch the Joe Rogan podcast with Stephan Guyanet and Gary Taubes? Brutal. Guyanet is cut from the same cloth as Joel Kahn. I couldn’t bear listening to him. I’ve only watched the first 15 minutes or so. It’s a looooong episode. I’ve come to the conclusion that the likes of Kahn and Guyanet treat their opponent in a debate with such unprofessional snottiness and ridicule is a cover up for either a lack of belief in what they are saying or they’re trying really hard to convince everyone, including themselves, that they are the smartest person in the room. They can debate and get their point across, disagree if they have to, without being a jackass about it. Neither of them have that trait. I toss Layne Norton into that group as well. It turns out that the Social Security table gives me 11 years to live. So I do have to think of 10 years as a long time. I haven’t bothered to read it yet and probably won’t, one look at the contributors and I suspect it will be high carb/vegan good, low carb/keto bad. Gary Taubes is the devil. From this post I decided to go back and read/re-read your blog from the very beginning, and it’s scary how little has changed. Well by now there are literally millions of people losing weight and improving their health just in the big Banting groups in South Africa and Nigeria alone, and hundreds of thousands of well controlled diabetics, and more and more clueful doctors and even dieticians. But The Anointed are currently fighting back with the same low fat and statins garbage that got us here in the first place. The list of contributors reminds me of what Nassim Nicholas Taleb says about Intellectual-Yet-Idiot types: they place too much value on academic knowledge and too little value on practical experience. The contributors appear to be academics with no clinical experience treating actual people. Spot on! And what’s more scary, many of them are young enough that they can keep The Stupid going for a few more decades. 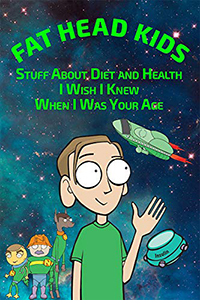 And the corollary, they are too young to have personal knowledge of a time when there were no “epidemics” of obesity, diabetes and other metabolic diseases, or low fat diets. I had another though, have you considered goats? Hours of fun and amusement, the tastiest milk possible and excellent meat, plus they will eat weeds, shrubs and all sorts. Plus you could probably train them as dieticians and they would do better than most of the current incumbents. You’ve turned on the lights for a lot of us over the past ten years. Congratulations on a decade of blogging. We will be neighbors in a few weeks. My wife and I are moving to Chattanooga in April. Welcome, neighbor. I predict you’ll love it here. Chris, my wife and I moved to Chatt a year ago and we love it! I don’t think you’ll regret it! Heh-heh … well, I’m sure a few people have bolted after a post pissed them off. Tom, While I haven’t been reading your blog from its inception, I have been enjoying it for the last four years, ever since going on my first low carb cruise. I appreciate your honest dissection of the crap about “diets” that’s out there. We, too, have five acres and 21 chickens – half are adopted from people who’ve grown tired of their “pets”. Mine, too, are “pets” who follow me around when I’m out in their yard but they provide me with fresh pastured eggs which is why I treat them so well. I’ve watched you struggle with damaged fencing and evil critters under your coop and loved how you weave then into fantastic tales. I, probably among many, anxiously await each post. Thanks for the first ten years and here’s to the next ten. Keep up your great work. Thanks. You almost certainly appreciate the farm reports more than someone who’s never dealt with chickens and predators. That’s interesting that your diet changed to higher protein. I bought a year’s worth of FreeStyle Libres (continuous glucose monitor) to “prove” that Ted Naiman’s higher protein caused massive blood sugar rises. Instead, I ate 80+, 120+, 160+ grams of protein in a single meal, and could not find any detriment to eating higher protein. In fact, I switched from higher fat to higher protein. Also, even though I eat higher protein, lower fat now, my HbA1c has continued to decrease. I’m down to 4.9, and not sure it’ll go much lower (at some point, it depends on how long your red blood cells last; the longer they last, the higher your HbA1c, so some people can get to very low HbA1cs if their blood cells don’t last long, while others can’t). I also found that fat really isn’t filling to me — I can always eat more fat. Protein, however, is filling to the point where if I eat enough protein, you could put a gun to my head and tell me to eat more shrimp or pork chops or whatever I just ate, and I wouldn’t or couldn’t do it. Give me a fat bomb, though, and I’d happily gobble it down. I am primarily keto, though. I will have the occasional higher carb fare, may even have some potatoes this weekend. But I usually stay near (higher protein) keto. And I still eat some higher fat keto meals, as they are easy to make. I also eat primarily meat, not eating vegetables much at all. Sometimes more veggies, sometimes less. I spent 5-6 months trying pre- and probiotics, and I could find no benefits, only detriments. I was able to stay in ketosis if I ate just potato starch, although I also tried heated/cooled potatoes, white rice, etc. This is a side effect of listening to carnivores like Amber O’hearn. I tried it, and felt better. I still like the taste of (cooked) vegetables, though. I now realize, however, that many vegetables do not agree with me. Zoodles, for instance, from zucchini causes me intestinal issues. Also, I highly recommend a CGM, as it tells you things you can’t get otherwise. For instance, popcorn ostensibly has higher carbs. I’ve eaten home-made versions twice and got zero — and I mean zero — blood sugar rise. On the other hand, I was trying to be “good” one night, when I knew I would have some ice cream pie after dinner, and the “seafood salad”, hot and sour shrimp (nothing but veggies and shrimp, no rice, noodles, etc.) and sashimi I had for dinner caused a blood sugar rise as high as the later-eaten ice cream pie did. I was shocked. Congrats on your 10 years. With the amount of garbage kicked out by the likes of Harvard School of Epi every year, you’ll never need to worry about not having something to blog about. Protein doesn’t jack up my blood glucose either, at least according to the meter. As with many things, it comes down to how each individual reacts. Jimmy Moore tried going way high on protein and had wild blood-sugar swings. For whatever reason, his body can turn protein into glucose very quickly. I’m like you. I find extra protein way more satiating than extra fat. Congratulations on the anniversary, Tom! Any time you are feeling a little down, you can remind yourself of the untold thousands of blog visitors whom you have helped. This reminded me of something that stuck in my mind from Linus Pauling’s book “How to Live Longer and Feel Better”, which I bought to see his advice on Vitamin C from the horse’s mouth. He wrotes about how he was being interviewed on TV with some critics, one of whom insisted that Pauling’s recommendations couldn’t prevent colds. He had tried Pauling’s advice, he said, and it didn’t work – he still got colds. After the cameras were switched off, on the way out of the studio, he remarked casually to Pauling, “Of course I didn’t take the doses you recommend – that would be ridiculous”. That’s funny and sad at the same time. IIRC the critic was Frederick Stare and the comment was made as soon as the camera was turned off. As Pauling said in his book, the comment revealed Stare to be a fool and no scientist. Yet how many times since have we seen the same behaviour in studies of nutrients? They use minuscule quantities of vitamin X or substance Y, or use the wrong form of the substance, then loudly trumpet that they’ve “proved” it doesn’t work. You’d almost think they’d designed the experiment to fail. Frederick Stare was the founder and head from 1942-1976 of the Department of Nutrition at Harvard School of Public Health – Anointed Central! – who apparently believed that Coca-Cola was a “healthy between-meals snack”. Not surprisingly under State the Harvard Dept of Nutrition was heavily funded by Big Sugar and Big Food. I’ve enjoyed your wit & humor since the first time I saw Fat Head. Time flies for both of us, apparently. Congratulations Tom. That’s a great milestone. I really like reading your articles. Not only is the information useful, but you have a great writing style that makes it also an entertaining read. Thanks. Congratulations on 10 years! I so appreciate the insights you have shared over the years. Ten years goes by fast! I was on Atkins when I first saw Fat Head on Netflix and it changed how I saw the food industry. Knowing that government agencies are trading our health for money was a real eye opener. Thank you for keeping us informed on what The Anointed are up, the farm reports, and being a pleasant surprise in my Facebook feed. Video posts would be most welcome! Interesting you mention Dr. Ted Naiman. He is local to me and I choose him for my GP a few years back due to his paleo affiliation, so I didn’t have to get a lecture about cutting fat or going on a statin when I see him. I haven’t had occasion to see him for anything diet related though. I’d love have to a guy like Naiman as my GP. Dr. Steven Horvitz is 15 minutes from me. I pass his office when I go to my osteopath for OMT treatments. He’s just too damned expensive for those of us on fixed incomes. He opted out of Medicare and other insurances a while back. He blames the system for him opting out. I blame him for not setting rates or a sliding scale for those of us with financial limitations. Then again, he’s in an affluent area. His care in patients are limited to those he knows can afford his rates. That’s sad, and he doesn’t like me because I have told him that! to my medical care. It’s worth it. I’ll be very few docs have patients willing to travel 1000 miles. The last dentist I saw in Denver had patients who flew in to see him–he was that good. If I wasn’t a cheapskate (or had any desire to go to Denver), I would, too. Happy blogiversary! I’ve greatly enjoyed following your blog, especially the farm posts. My family is hoping to make a similar move in the next few years. Please do make video posts! That would be awesome! I certainly want to produce videos. It’s a matter of finding the time. Congratulations on ten years of top-notch blog posts! And I’m glad you plan to stick around. We need you. We’ve won a few battles, but the war still rages, and will until The Anointed die off from following their own advice. I have no plans to retire from blogging anytime soon. Congrats! Wish I had discovered you ten years ago instead of 10 days ago! Don, click on Archives over at the right side of the page. All the posts are there, going back to March 2009. It took me weeks, but I read and enjoyed every one of them — plus the comments, which often contain good information and insights. Thanks Dianne, I am working my way through them already. I love the sarcastic wit and humor that flows through both the articles and comments. Comments are a BIG part of what makes this fun (and often informative) for me. How much has changed, and yet how little. Congratulations, Tom! I have been reading your blog since almost the beginning when I started Atkins. I have stayed low carb all these years and I appreciate your posts and insights. I have also read many of your book recommendations. Thanks for helping me along on my journey! I love your farm reports too! Thank you. We’re heading out back to the spring project later today. Congratulations! We follow you enthusiastically from a bit south of you (Columbia). WARNING: Once you have an actual milk cow, you, or somebody else on the property is married to it! When they need to be milked, they need to be milked. No excuses! That’s one of the considerations. The chickens already need daily visits, so perhaps it wouldn’t be too much of an adjustment. I looked but couldn’t see one for grass-fed beef. Jersey would be good, or most any old breed other than what a farmer disparagingly called “them kipper-arsed Holsteins”. Do you get Dexters? – pocket cows and dual purpose for milk and beef. Here’s to the next ten years though I probably won’t be around that long. Pretty sure if we get a cow, we’ll expect to do the milking without robots being involved. A cow is the operative world. Just robot milkers just not feasible for one cow, IIUC. A close, nay intimate, relationship with your cow, such as is involved with daily milking, provides plenty of opportunity to comprehend the health of your cow. Agreed. Not something I want to automate. If we had a big ol’ dairy farm with hundreds of cows, maybe. Agreed, they are really for big herds. Interesting concept though, the cows decide for themselves when they want to be milked. You could probably pick up some suitable old tech stuff like a butter churn or cheesemaking equipment. Fat Head Cheese might sell. Congratulations on the 10 years. I’m a long time follower ever since I first saw (and loved) the movie. I think video ppsts are a great idea. Please do some, I’m guessing they’ll be hugely popular. Definitely on my to-do list. Just a matter of squeezing the production time into my schedule. Tom if you do videos can you please include transcripts? I odn’t always have time to listen to a full video but can usually work through transcripts quite quickly. I’d be scripting the videos, so posting a transcript would be a piece of cake. Video posts without transcripts are the bane of my existence. Not only do they chew up my bandwidth, they also chew up my time, since I can read a lot faster than the presenter can talk. Plus unless tightly scripted a lot of the dialogue can be useless chitchat. Jimmy Moore is a particular offender here: his hour-long interviews might have 15 minutes of useful information but you have to wade through 45 minutes of chaff to get them. Besides, if you’re going to write and edit a script and prepare visual aids, wouldn’t it be simpler to just write it as a blog post? Another problem is that video and audio posts are not searchable by Google. Can’t remember which video you saw something in? Tough luck, you’ll never find it again. It’s been great reading your blog and I shall keep doing so! Congratulations, Tom! Your documentary is the reason we started looking into low carb/Paleo/etc. I’ve been reading the blog since pretty much the beginning and, like you, I’ve made some adjustments to my diet over the years. I have many blogs bookmarked but yours is the one that I consistently read for your down-to-earth, yet intellectual take on the nutritional madness in our country. I hope to see many more years of posts! Same here. I follow a number of doctors and other LC advocates on Twitter and am finding them becoming increasingly sarcastic, arrogant and combative. Of the group, I’d say Tom, Tim Noakes, Amy Berger and Michael Eades have maintained the same, even keel throughout. The rest I feel, say things just to see how many likes and retweets they can generate while regurgitating the same information. They spend so much time on Twitter that it makes me wonder just how many patients they actually have. I’ve been enjoying your blog from the beginning. Now, I wonder why you don’t have ponies yet on the farm. Congrats on 10 years! I would prefer a podcast to video posts, but I will listen to the video posts while cooking if not “watch” them 100% of the time. I promise to speak clearly. Congratulations Tom! I’ve been a regular reader of your site from the beginning. It’s one of the sites that’s always open in the browser on my phone so I can check for new posts. Thanks for all the information, thoughtful insights and humor. I’ve been a fan for a long time. I appreciate your common sense approach to health and diet, and I especially enjoy your sense of humor. You have a beautiful family, which is a testimony of yours and your wife’s character. I hope to do a low carb cruise one day since my husband and I have discovered the joys of cruising. Happy anniversary! We’ll see you on a cruise someday. Happy blogiversary! Many happy returns! Happy Blogiversary, Tom! I’m a longtime reader and sincerely appreciate the information you’ve provided here. Looking forward to the next 10 (or more, please) years with you. Bring on the Vlogs! The vlogs are coming. I decided if I wait until I have more free time, it’ll never happen. So it’s a case of just do it. FTL: In a Jan. 14 video titled “Why I’m No Longer Vegan,” YouTuber Bonny Rebecca set the tone for a mass of defections to come: rambling, half-hour-long videos in which the former herbivores apologize to their fans and breathlessly explain the health issues that caused them to start eating meat. In Bonny Rebecca’s case, it was the extreme digestive issues that the 26-year-old says led to bacterial imbalances in her gut and caused her boyfriend, fellow vegan YouTuber SlimLikeTim, to drop more than 30 pounds. Heh-heh … it’s getting ugly out there in VeganLand. Congrats Tom! A whole decade and you haven’t dented your head in yet on that desk. I assume you still have the duct tape nearby to impede any possible exploding head issues. I keep the desk pillow handy. Congratulations on the 10 years. I am in the same boat of “wish I’d seen this ten years ago instead of barely a year ago”. But, in the last 7-8 months, I’ve lost weight, dropped BP, and improved many medical readings significantly – all eating foods I enjoy. (though the temptation for bread/chips is strong at times, I know it’s not worth it) All of that got me really looking at diet/nutrition and reading more about what goes into our foods. Did you ever explain how you worked w/ your kids to switch them over to low-carb eating? It’s one thing to do it as an informed adult but how do you wean the kids off of that tasty bread when they’ve been eating that way for a while? Did you just say “that’s it – no more”, replace the menu, something else? 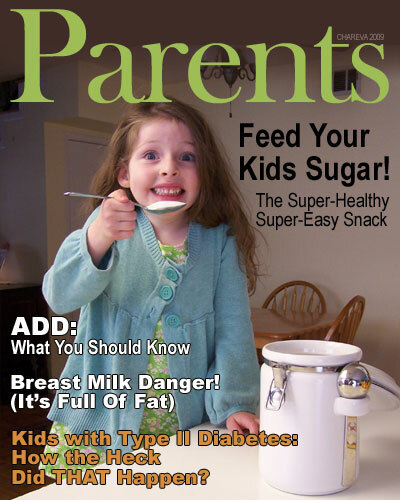 We keep our girls lowish-carb by simply not having the junk — cereal, pop-tarts, sodas, candy,juice boxes, etc. — in the house. My younger daughter is much more of a carbivore than her her older sister, so we know she cheats more often when Mom and Dad aren’t around. But at home, she can only eat what’s available.